Hmmmm. Is that the smell of fresh brewed coffee? Yes, it must be morning and breakfast is being prepared for guests at our bed and breakfast. Oh, you prefer tea? Well, you're in luck...we have not only a British theme at this bed and breakfast, but over 20 kinds of tea for you to choose from...and some lovely teapots to go with it. Have a 'cuppa'! Fruit course, fresh cakes, main course... right at 9am. Breakfast in our everyday world is usually rushed and often a cup of coffee on the dashboard! 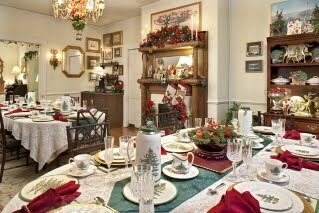 Our bed and breakfast experience in Asheville, NC offers a friendly, cheerful respite from the break-neck speed of daily life. So relax, take a deep breath and meet some people for the first time, or travel with friends...take the opportunity to slow down, just enough to rejuvenate. The charm of the "old World" is something we can all appreciate now and again. Take a walk in our neighborhood, the Montford Historic District, just north of Downtown Asheville, before or after breakfast. You'll experience the charm of the "new World" but in a time gone by...with lovely homes all around us that, like Abbington Green Bed & Breakfast, have been here 100 years. 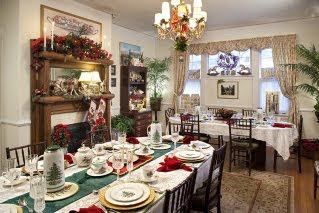 Beautiful food, thoughtfully prepared...always served on crystal and china, on Christmas china at this time of year...shared with other interesting travelers...You'll have stories to remember! Merry Christmas to you and yours!